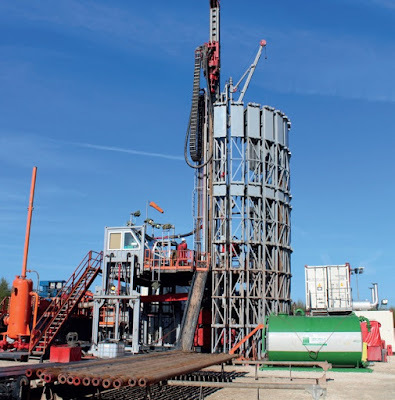 The ecologist at Rotherham Council has put forward a number of reasons why INEOS' plans for a test drilling well at Woodsetts should be refused. Rothbiz reported last month that, unlike the Harthill application, the Woodsetts application can be supported from a highways point of view, despite transport objections being raised from the local parish council and campaign groups. The application is set to be discussed by the Council's planning board next week and the planner's report sets out all related issues including the Greenbelt use and impacts on traffic, water, noise, landscape and heritage. Consultees such as Public Health England, Health and Safety Executive and the Environment Agency are not objecting to the plans. The proposal is not considered to represent inappropriate development in the Greenbelt and on transport, the report concludes that safe and suitable access to the site can be achieved with the cumulative impact of the development in transport terms considered unlikely to be severe. However, the report makes it clear that the ecological information submitted by INEOS and its planning consultants, Turley, is insufficient. Andy Godfrey, ecological development officer at Rotherham Council, makes a number of points on the applicant's habitat surveys. For example, the Phase 1 habitat survey did not include Dewidales Wood, an area of ancient woodland that is 25 metres from the site. The applicant was denied access but the ecologists expected surveys to be carried out from the adjacent bridleway or from the site. The report states: "The lack of survey work on breeding birds, badgers or other wildlife by the applicant within Dewidales Wood means that it is not possible to know what is present and consequently the Council does not know what might be impacted." The authority cannot tailor mitigation for the woodland due to lack of data. The ecologist is critical of the surveys for badgers, bats and breeding birds. For example, the applicant's Environment Report states: "No birds were observed on the proposed site during the extended Phase 1 habitat survey or during subsequent visits to the site for bat surveys." The Council's ecologist considers it unlikely there were no birds whatsoever on any of the surveys. The ecologists also doesn't agree with the impacts, such as lighting, construction and development and noise, being considered "Not Significant." The report concludes: "Overall, the Council's ecologist considers that the application has a significant lack of supporting data due to lack of, or incomplete surveys and as such the Council cannot adequately assess the submitted details. "The Council considers that the applicant has submitted insufficient evidence of attempts to try alternative methods where access could not be obtained. It is not considered that these issues could be satisfactorily considered and it is therefore recommended that the application is refused on lack of ecological information n and in conflict with paragraph 118 of the NPPF." This is the national planning guidance which states that local planning authorities should aim to conserve and enhance biodiversity. Having been denied the chance with the first set of INEOS plans at Harthill, members of the planning board will vote on whether to refuse the plans on March 8. The planning board voted unanimously to refuse the plans. It also added in traffic and transport as another reason for refusal, in addition to issues over the ecological survey.